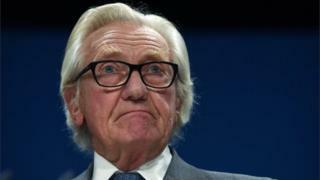 Conservative former Deputy Prime Minister Lord Heseltine has been sacked as a government adviser after rebelling over Brexit in the House of Lords. Lord Heseltine backed the demand for a parliamentary vote on the final deal to be written into Brexit legislation. Lord Heseltine learned hours later that he had been fired from five government advisory roles he had held. He said he accepted Number 10’s right to sack him but “sometimes there are issues which transcend party politics”. Lord Heseltine told the Lords that the UK was facing “the most momentous peacetime decision of our time”. The peer said he was having dinner with his wife when he got a call from the chief whip, and went to the Lords to be told he was being sacked. Lord Heseltine told the BBC: “This is not my judgment, this is the prime minister exercising her perfectly legitimate right to get rid of opposition in any way she finds appropriate. “Whether it’s a wise thing to do is a matter for her not for me. He continued: “I did write a newspaper article the other day setting out exactly what I intended to do so I think they could have told me this would be the price but let me make it quite clear; I would still have voted as I did tonight. “Sometimes in politics there are issues which transcend party politics; in the end you have to be your own person. I believe our interests are intertwined with Europe. I am not prepared to change. Media captionLord Forsyth says the government has committed to give Parliament a vote on a Brexit deal. Ministers have said they aim to overturn the two defeats peers inflicted on them in the Lords on the Brexit bill. When the bill becomes law it will give the prime minister the legal permission she requires to begin the process of leaving the EU. Brexit Secretary David Davis has said some in the Lords are seeking to “frustrate” Brexit but it was the government’s intention to ensure that did not happen. When the bill returns to the Commons next week ministers will have some persuading to do but Theresa May remains on course to trigger Article 50 and begin Brexit negotiations before the end of this month. Like Ken Clarke in the Commons, Lord Heseltine was determined to remain vociferously pro-European both before and after the referendum. BBC political correspondent Chris Mason says Lord Heseltine’s sacking illustrates Downing Street’s determination to pointedly press ahead with Brexit. Lord Heseltine, 83, served as a minister in Margaret Thatcher’s government in the 1980s. He was brought in by former Prime Minister David Cameron to advise the government on a range of projects, including schemes in east London and Swansea. Peers voted by 366 votes to 268 in favour of an amendment to the bill to have a “meaningful” parliamentary vote on the final terms of the Brexit deal. After a three-hour debate on Tuesday, the turnout for the vote was the largest in the Lords since 1831, according to Parliament’s website. As well as Lord Heseltine, 12 other Tory peers defied the government to vote in favour of the amendment, including former ministers Lord Deben and Viscount Hailsham. Mrs May has said she wants to trigger Article 50 by the end of March but the Commons is unlikely to have an opportunity to consider the changes made by the Lords until the middle of next week as four days have been set aside for debate on the Budget.